Chinese food is sometimes equated with dishes high in fat, calories and sodium. While this is partially true, your own choices can make a world of difference. According to Nutrition Action, you can reduce the calorie content of Chinese dishes by requesting extra veggies and reducing the meat in the dish, switching to brown rice and avoiding dishes that are swimming in sauces and oils. When possible, choose a small dish from the entrée or side dish selection, rather than a main course. 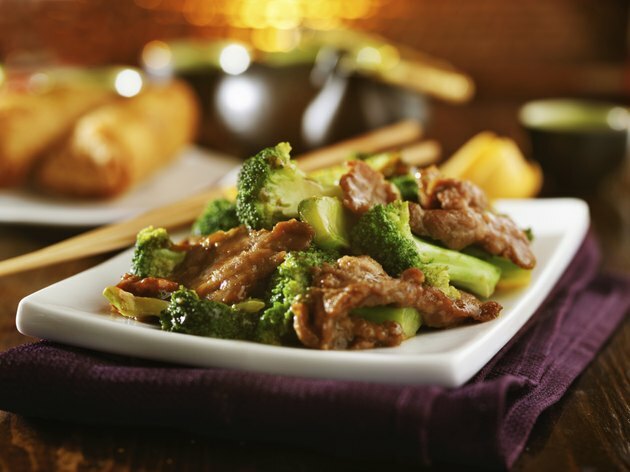 Chinese food contains many dishes that are deep-fried, which means they're high in calories and fat. Pork and beef are common meat choices for many dishes such as the 1,000-calorie mu shu pork and the 1,300-calorie sweet & sour pork. Tofu might seem like a healthier choice, unless it's deep-fried, in which case it can push the calorie count up significantly. Although Chinese food is often labeled as unhealthy, you can maintain your health and keep your waist in check if you stick to certain items. Chinese dishes contain plenty of vegetables and many dishes are steamed. Noodles, soups and steamed rice are some of the best options when it comes to calories. Wonton soup, for example, contains only 100 calories and 1g of fat per serving. Other good options include the spring rolls, at 100 calories each, and the shrimp with lobster sauce, at a cost of 400 calories. Anything with the words crispy or fried in it is likely to be high in fat and calories. For example, the combination fried rice, which is usually served with four or five different kinds of meat mixed in together, can come with as much as 1,500 calories. The orange crispy beef contains the same amount of calories as well as 11 g of fat. Not far behind is kung pao chicken and lemon chicken, each with 1,400 calories. Choose fried veggies and you'll be consuming as many calories as you would with any other dish. To avoid this, ask for steamed vegetables and sauce on the side. Stir-fries are often OK as well, since less oil is used. According to My Fitness Pal, the vegetable lo mein has only 30 calories per cup, making it one of the best choices on the menu. On the other hand, the stir-fried greens contain as much as 900 calories, the same amount you'll find in the home-style tofu and mixed vegetables. The eggplant and garlic sauce is probably one of the worst vegetarian options at 1,000 calories per dish, while the stir-fried mixed vegetables, also known as Buddha's delight, only contains 500 calories. Some of the high calorie counts of Chinese dishes come from the add-ons. For example, many of the sauces are made with oils and add lots of sodium and calories on top of the ones found in the dish itself. Many dishes are also battered or breaded, increasing the calorie count.